Over the past decade or so, more and more drivers have made fuel efficiency the foremost priority on their shopping list for a new car. With all this driver interest in fuel economy, there's been an arms race from automakers to make the most efficient cars as affordable as possible. Perhaps no model is as synonymous with fuel efficiency than the Toyota Prius, but many may not know is that it has a sister model, a plug-in hybrid, the Toyota Prius Prime. The 2018 Toyota Prius Prime takes the tradition of excellent fuel efficiency with the Toyota Prius name to the next level with its electric vehicle functionality. If you're looking to learn more about the plug-in hybrid, you've come to the right place! We're going to take a deep dive into the 2018 Toyota Prius Prime's engine specs, its charging capability, in-car technology and safety! Let's see what this car has to offer! Where better to start than underneath the hood? The 2018 Toyota Prius Prime comes standard with an efficient but surprisingly powerful 1.8-liter 4-cylinder engine paired with a hybrid system that gives out a net 121 horsepower. In hybrid mode, the 2018 Prius Prime gets an incredible 54 mpg combined, but with the electric vehicle functionality, its mileage estimated bumps up to an outstanding 133 MPGe! If you're new to plug-in hybrid car models, you might be worried or confused when it comes to charging. With the 2018 Prius Prime, though, there's no reason to worry! It comes with a charging cable that can be plugged into any standard outlet, and can be fully charged in less than six hours! The technology in the 2018 Prius Prime isn't just for fuel efficiency, though. The Prius Prime also comes with a wealth of in-car technology like an 11.6-inch full-color HD multimedia display to make accessing all the information and entertainment you need easier than ever! Plus, thanks to the color Head-Up Display, you don't have to take your eyes off the road to check your gas or battery life! 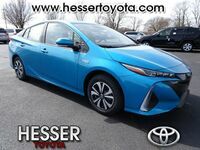 Test Drive the 2018 Toyota Prius Prime at Hesser Toyota in Janesville, Wisconsin, Today! Want to learn more about the 2018 Toyota Prius Prime? Ready to get behind the wheel of one? Contact our staff at Hesser Toyota for more information or to schedule a test drive today!